Forest Hill curtain panels provide a contemporary, yet natural look to any room in your home. The natural branch motif design is printed on a lush polyester fabric that has the look and feel of linen. These panels are interwoven with blackout insulation provided by Light Block and Thermax technology. Designed to block light and preventing harmful UV rays from reaching your floors and furniture, the panels also prevent cold or heat transfer from the outside, increasing the energy efficiency of your home. The Forest Hill panels provide unparalleled privacy and allows you to create darkness any time of day, making them perfect for anyone seeking to block daylight, take a nap, or keep sun glare off your TV. 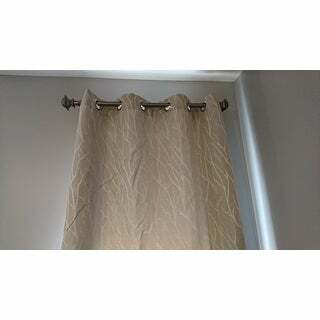 The Forest Hill panels are constructed with gorgeous, matte silver grommets and can be hung on your favorite curtain rod up to 1 5/8" diameter, adding yet another touch to the finished look of your window decor. These window curtain panels will drape beautifully from any window that could use that perfect, finishing touch. 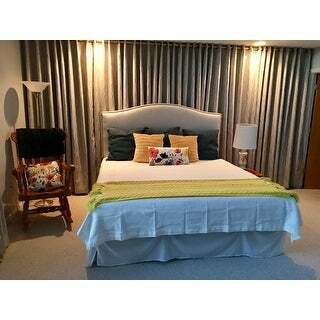 Our curtain panels are perfect for any living room, bedroom, family room, dining room, bathroom and office. Our stylish designs will suit any window space. Dimensions 84.0 In. X 52.0 In. X 0.2 In. I picked these up along with another pair for use in either my bedroom, or living room. After hanging a panel of each in both rooms I did elect to use these in my bedroom, but only because I have wooden shades as well on the windows and just needed a bit more blockage of light. There is still some that is let through, but not enough to bother me. I have attached two pictures, that is a south facing window at noon with the wooden shades closed. It's also the dove grey colored panels, which are lighter and more tan then one would expect. It worked out fine for my bedroom given the artwork I have up, but it is something to note. I do like them, but if what you want is a cave like setting, these are not the panels for you. If all you need is to drop the light level a bit and want a very nice looking panel at the same time, then I strongly suggest you consider these. 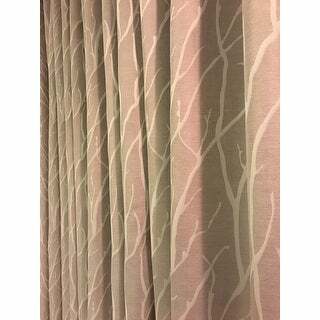 These curtain panels are very nicely made they help keep the sun out and the branches look great. I used four panels for my sliding glass doors. It is more elegant and beautiful than I expected, the color goes with any decor and gives a brighter scheme to my living room and the light color makes a room bigger yet it keeps the sun out of my living room. LOVE IT. 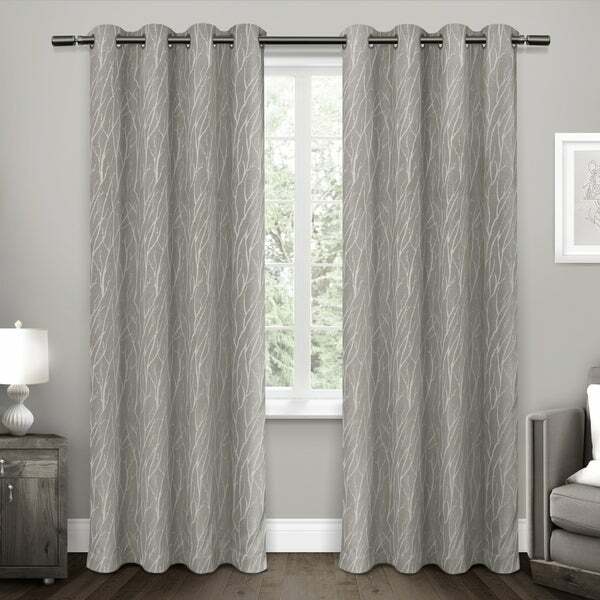 These curtains are perfect for any room in your home. They block out the light and keep the room cooler and darker for sleeping. I recommend this product. Love these. I bought both the ash grey and dove gray so that I could choose the color I wanted since I really couldn't tell by looking online. I kept the dove grey , returned the other and purchased a total of 9 of the dove grey. (The dove grey is more of a brownish grey, the ash grey more of a blackish grey.) I used them to cover a set of three large windows and to cover a wall that I was going to put my bed up against. The wall was cold and also there was an air conditioning unit on the other side of the wall that was noisy. It was amazing how quiet and how much warmer the room was after I installed the curtains. The curtains look great - very luxurious. They do darken the room using about 2-2.5 feet of curtain for every foot covered. Not completely blackout, but dark. I also have blinds behind them and the combination is blackout. Having purchased nine sets - I had to hem because I needed about 93" and they came 96". They weren't all the same exact length when I got them, so had to do a bit of work to make them how I wanted them. That being said, I would buy again, as I just love the look and the fabric. All of them were wrinkled when they arrived - some very much so, but I was pleasantly surprised that I could iron them myself with fairly high heat and the steamer setting on the iron. Was very easy to get out the wrinkles. 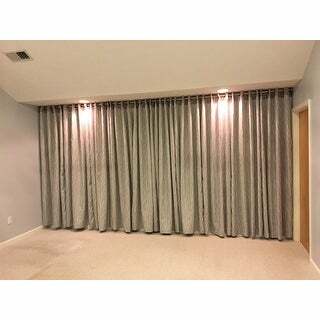 Love these Forest Hill Woven Blackout Grommet top curtains. I ordered 2 pairs and they work great over our patio door. I recommend highly. Incredibly beautiful and well made drapery panels. They are heavy, lined and add a luxurious touch to my living room and dining room. Would highly recommend! I was a bit dubious when I ordered these curtains due to the price. But I was pleasantly surprised when I got them and hung them up. They are very stylish and they do function quite well to keep the light out. 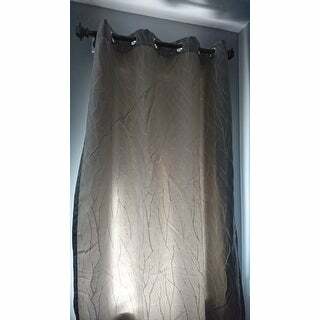 I have a neighbor who keeps on their flood lights all night long and they shine directly into our bedroom window and with these curtains I can still get a great nights sleep and my room is completely dark. It was a great buy! These curtains are as described and gorgeous for a warm, comfortable living space. I'm using them in the formal (not formal, but not family room either) living room. The ash grey is a greige color, and the tree braches are not stark white, and don't have any yellowish in them. I'd call them white to off-white. I love the subtle woven print. I'd have rated these curtains higher, but they are NOT blackout at all. Not sure why they'd even be described that way. I really like the simple pattern of small branches as it will coordinate with almost anything. They'd benefit from some hem weights as well. overall, I'm happy with the drapes. I wish they stop labeling drapes as "Blackout" when they do not fill that function. Otherwise, quality is great, color is as depicted. Love these curtains, they look so nice in my living room and were just as described if not better. I love the color and they have a soft look to them, which just adds to why I like them. Very satisfied customer! Love these drapes they really block out light . 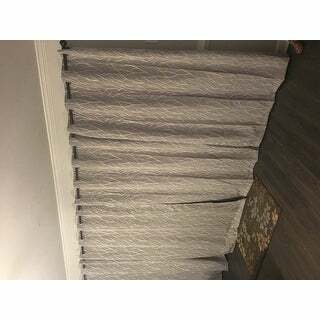 Beautiful curtain great quality easy to hang! Perfect color they cover an 8 foot door and stay open during the day ..
Love the room darkening of these curtains. had to buy weights to make them hang the same as in picture. These curtains arrived and they are gorgeous. The fabric and quality were better than what I expected. Although I was looking for a deeper gray color they are so beautiful that I am keeping them! It's hard to decipher colors by internet photos but the reviews did help. I will tell you that they are not a deep gray color but more of a medium to lighter gray. I will update with a picture post when I have them up. very nice quality. They look better then the picture. I love these drapes, I bought them to go over 1/2 of my sliders, and it works perfect. Gives my room an uplift and also outside looking in has a pattern on the back of the drape so you don't just have a white blank. These curtains arrived very quickly. I did not have time to hang them for a couple of weeks, but the packing wrinkles disappeared in a day after hanging. Look fantastic! I needed white curtains for a basement bedroom. The blackout versions I'd seen in a local discount store were stiff and boring. I like that these are softer & have a little pattern. I have small windows, so I'll use one panel on each. The windows are daylight style, so they don't need to reach the floor, but won't look short or awkward. The white will definitely brighten it up too. Thank you for having so many choices!! "In here it says the ash gray is lighter but pictures show dove gray is lighter? Looking for a really light silver/ gray ? Which would be best ? " "Can I return them if they don’t work out?" "Are these curtains by Residence? I am looking to match my existing ones and I believe this may be the find!" "Do these come in pairs or is it one to one ordered?" This is a set of two panels. "What is the diameter of the holes for the curtain rod?" Matte silver, it looks amazing! Very neutral and elegant. I liked the airy look of the curtains, light and crisp!